Add some beautiful shabby chic style to your home with this pretty wall clock with photo frame dispay. Perfect for displaying in the living room or hallway. Just what you need for framing those special moments of children and family captured on camera. Display all those magical memories and candid moments in the 8 frames. This will make a great gift idea for Christmas, birthdays or just as a treat for yourself. 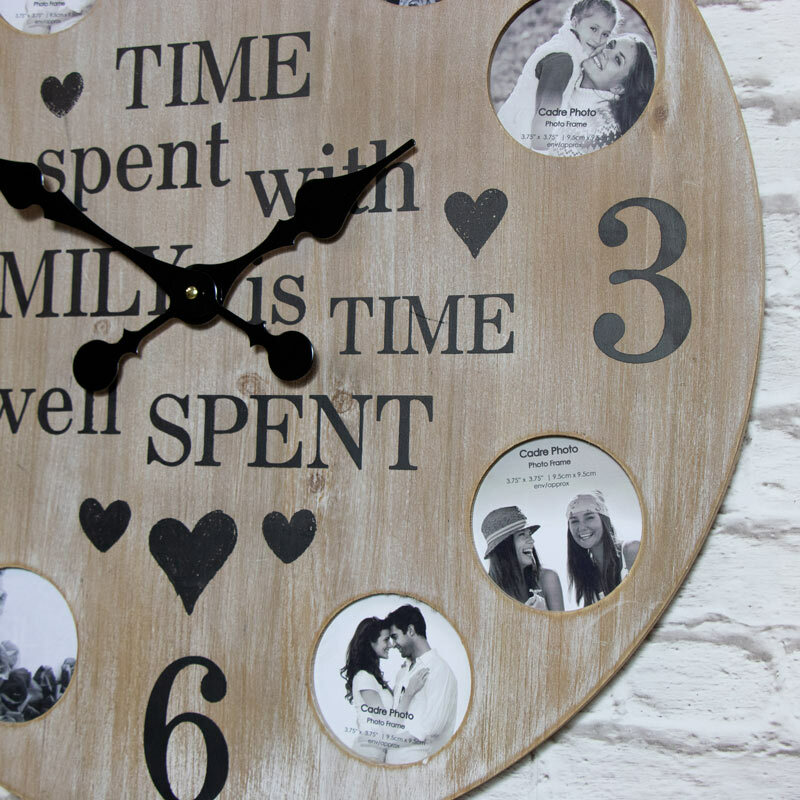 Add some beautiful shabby chic style to your home with this pretty wall clock with photo frame dispay. Perfect for displaying in the living room or hallway. Just what you need for framing those special moments of children and family captured on camera. Display all those magical memories and candid moments in the 8 frames. This will make a great gift idea for Christmas, birthdays or just as a treat for yourself. 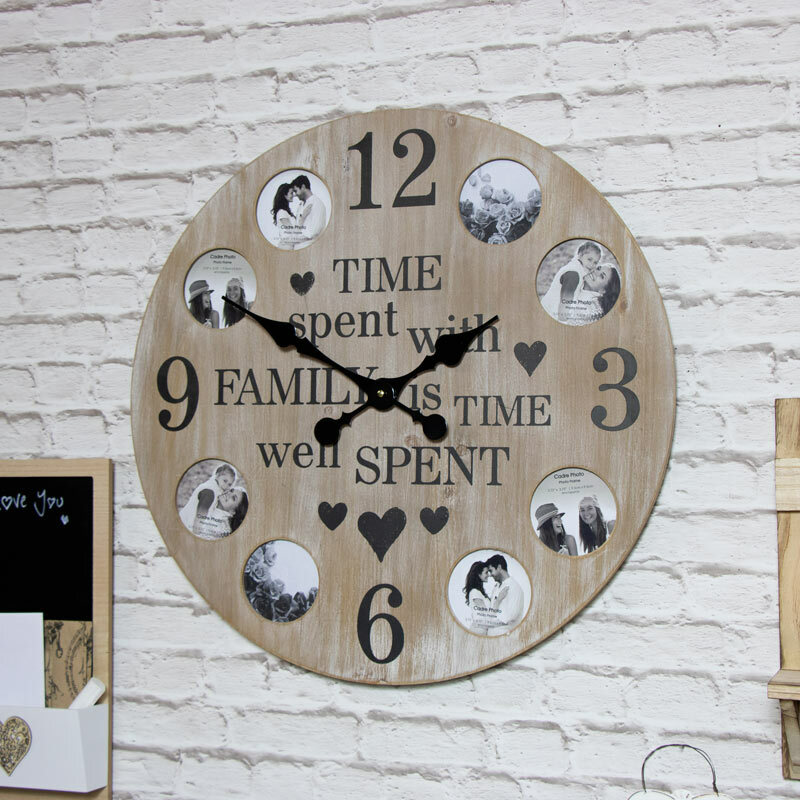 Large size clock made from wood in a natural finish with black text. Easily wall mounted with a hook on the back for hanging. Takes x1 AA battery (not included). The 8 photo frames on this gorgeous clock allows you to create a pretty display. With 8 frames each measuring 9.5cm x 9.5cm, this is ideal for traditionally processed photos and your digital prints.